The term "intrusive advising" has been used since the 1980's to describe advising that involves personal contact, student responsibility for decision making, student recognition of causes of poor academic performance, and problem-solving for the future. An outline of specific strategies for intrusive advising from Martha T. Garing, a former board member of the National Academic Advising Association. Conclusion: "A structured developmental education program that identifies, focuses on, and addresses students academic, nonacademic, and personal factors can positively affect student success and retention." This tutorial provides first-year students with an introduction to college academic policies, procedures, and resources in a timely and student-friendly manner. Early Results from the Opening Doors Program indicate that students in the program group were more likely than students in the control group to reenroll in college after one semester. They also registered for and earned more credits. "The progression from intrusive advising programs to integrated and systematic learning skills instruction resulted in substantial gains in first-year retention rates for program participants." "This study compared student satisfaction with various academic advising arrangements and determined the underlying considerations that affected their satisfaction." This monograph focuses on the first year of college and the need for structured first-year programs that help at-risk students make a successful transition to college. Includes a section on intrusive advising. CSULB employs several interventionist advising programs to ensure that students are on track for a timely graduation. All first-year students are required to meet with advisors three times their first year. "A promising practice Brandman University uses to promote college completion and retention of non-traditional age students." A new approach to categorizing students based on a combination of risk of leaving and risk of poor academic students received targeted tutoring, “intrusive” advising, and engagement services. See the index for content on proactive advising. 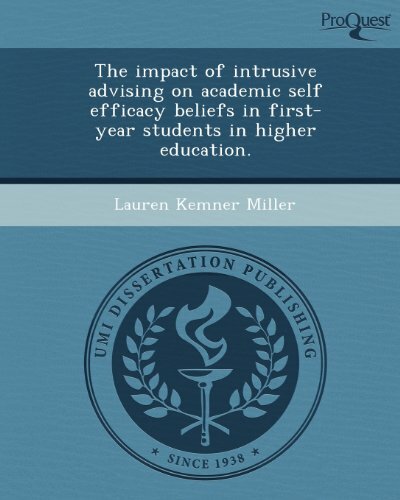 "This study addressed the existing holes in the research that have been identified regarding the relationship between intrusive advising and self efficacy of first-year students."